NEBOSH have made a number of updates to the syllabus for the NEBOSH International General Certificate in Occupational Health and Safety course. Our course brochure reflects the updated syllabus. One change that has been made is that delegates can now carry out the practical assessment in their own place of work, rather than at a venue organised by the tutor. This will make the practical assessment more meaningful for people who complete the course. We are currently taking bookings for the next course which commences on 26th March. The course is an eleven day course, two weeks 26-30 March and 30 April – 04 May. The eleventh day, a revision day will be held on 30 May in preparation for the NEBOSH exams on 13 June. Pass rates for our delegates well exceed NEBSOSH average rates. 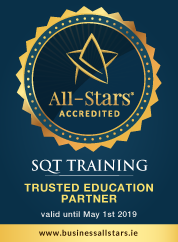 For the last exams held in June 2011, all SQT delegates passed all three units, a pass rate of 100%. The NEBOSH average pass rate across the three units for that exam sitting was 63%. The International Certificate course syllabus covers International legal frameworks and codes of practice but our SQT course also covers Irish legislation. Other centres in Ireland run the National Certificate which is based on UK legislation. Click on the course title here to see the full course brochure, NEBOSH International General Certificate in Occupational Health and Safety. Please contact Eilish Cummins, ecummins@sqt.ie or 061 339040 with any queries or to make a course booking.